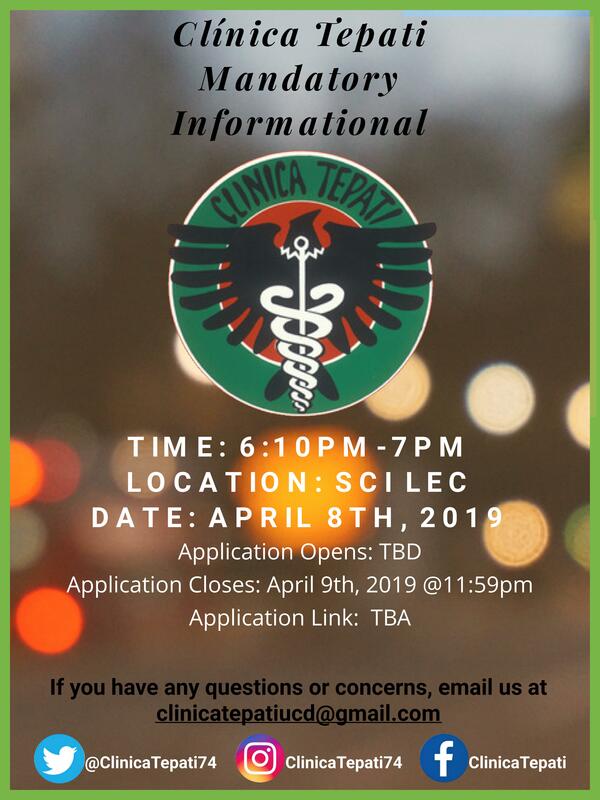 Clínica Tepati is a non-profit, student-run clinic in Sacramento, CA that provides free primary health care services to the uninsured population of Sacramento and the surrounding area. Today, it continues to fulfill this mission through the dedication of UC Davis undergraduates, medical students and the generosity of physicians and supporters. Together we are able to care for thousands of patients each year. Interested in Joining the Tepati Family? Attend Our Mandatory Informational to Learn More! Clínica Tepati provides basic healthcare services to the underserved Latino community. Undergraduate and medical students learn from first-hand clinical exposure in a respectful environment. Clínica Tepati volunteers go beyond providing the standard of care to become true patient advocates. 2018 Big Day of Giving!